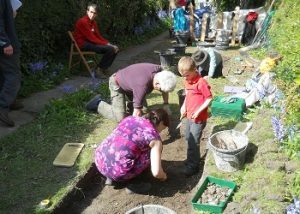 A pilot community dig project in a garden in Hyde, which was thought to contain the robbed out elements of the south transept of the abbey church took place in April 2016. 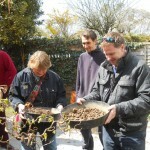 The dig was supported by WARG, the local archaeology and history society, who provided the equipment and supervisory expertise. David Ashby, ARCA, University of Winchester was Advisor to the project. The purpose of the dig, in the form of two test pits, was as much about involvement of local people of all ages in the process of archaeology as it was to establish the remains of the church. The event provided an introduction to the dig process for 37 participants (ages ranging from 5 to 75) through 2 hour time slots separated between digging, sieving and finds processing and recording. Feedback from participants showed that the project had been highly successful both in terms of their experience of the dig and the wish of all of them to take part in another dig within 6 to 12 months. This stimulated a second, more extensive project which took place in April 2017. The project was successful in identifying a N-S wall within the garden. Due to the limited size of the test pit the width of the wall could not be established. 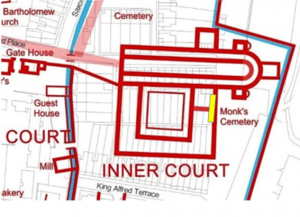 Based upon the results of the extensive excavations of the 1995-99 Community Dig (unpublished) there is a strong possibility that the find was of the east wall of the south transept or a cloister building. 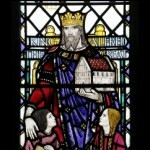 The abbey was dissolved in 1539, and such was its importance that Thomas Wriothesley was personally in Winchester to supervise the destruction of the church. It was apparent that is was speedily achieved as Leyland reported the scene as one of desolation in early 1540’s (Wall JC Alfred the Great: his abbeys of Hyde, Athelney and Shaftesbury 1900 p75 ). 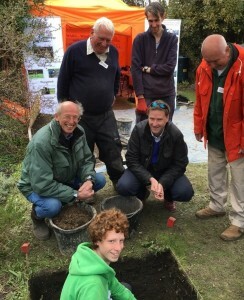 The community dig took place in a garden at the east end of Alswitha Terrace, Hyde, Winchester, which was predicted to contain the robbed out foundations of the south transept of the church. 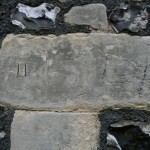 There had been some finds of non-local stone which may have come from the demolition of the abbey. From the design of the bridewell the area was known to have been the garden of the prison governor. Any archaeology was expected to be found approximately one metre below current ground level. There has been no excavations to date in the predicted cloister area. This limited excavation took the form of two test pits, one metre square. The excavation would take place in accordance with guidelines set out Test Pitting Methodology (Test Pitting Methodology David Ashby, Project Director, Stanford in the Vale Archaeology Research Project) The pits would be dug in 10cm spits, and contexts allocated on the same basis. All spoil would be sieved through 1cm square sieves. Trench 2 was found to contain at a similar depth demolition mortar and what could be the base foundation of a wall or floor. There were no significant finds, possibly due to the nature of the buildup of topsoil for the prison governor’s garden. Chrissie and Martin Leyden for unstintingly allowing their garden to be destroyed, and for suppling the supervisors with copious tea and coffee. Paul McCulloch West Office Manager Pre-Construct Archaeology Ltd for timely assistance at the 11th hour. My colleagues in Hyde900 for the support – in particular Susan Jones and Caroline Scott who assisted so ably with liaison with householders and with the booking and administration.